Or just be my Facebook fan. 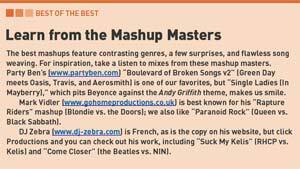 I don't know how they knew that, er, I'm a self-hating PC (saddled with Windows since my many years at all-PC LIVE 105) but computer mag Maximum PC has offered my goofy tracks up as an example of "inspiration" in an article on creating your own mashups in their February 2009 issue. (Thanks Shawn who e-mailed me and let me know). They apparently like Version 2 better than Version 1 of good old "Boulevard" (Eminem is so 2005, I guess), and get a "smile" from "Single Ladies (In Mayberry)," which is nice. Plus they put me in a box with Go Home Productions and DJ Zebra, my inspiration and my French, er, maison-garcon, respectively, which is also nice. What's more nicerer is that their article will hopefully provide a helpful alternative for people who e-mail me all the time asking how I make these silly bootlegs and aren't satisfied with my brief explanation on the Info page. Finally, some peace and quiet! But really, audio-only mashups are so, like, 2007. 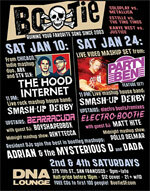 So if you've found that my DJ sets at our local bootleg haven Bootie have been entertaining for your ears but rather dull on the eyes (I don't jump around very much), why not come out this Saturday January 24 for my 3rd annual headline set at our little club, which for the second year will be a live video set. Which means: stuff to look at! I'll of course be featuring some oldies but goodies as well as some brand new tracks, plus some oldies but goodies made (hopefully) more enjoyable by mucking about with them in a remix style. I'm still in the midst of creating new tracks and corresponding videos, but I've finished one entertaining little item, a remix of "Boulevard of Broken Songs" using Kanye West's hypnotic "Flashing Lights." DJ Earworm tipped me off to Facbook's higher-quality video system, so if you want to watch it, go over to my Facebook page. I won't make you promise to come out on Saturday, but you can at least be my Facebook fan or whatever.